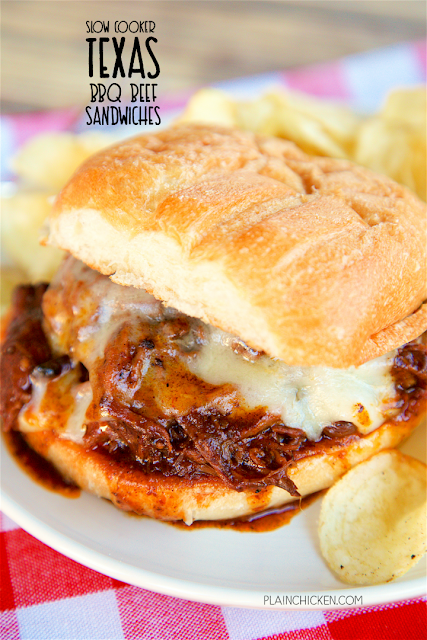 Slow Cooker Texas BBQ Beef Sandwiches - only 3 ingredients! Seriously delicious!! Serve beef on top of hamburger buns with a slice of cheese. Great for potlucks! We love this easy slow cooker beef recipe! Can freeze leftovers for a quick meal later! 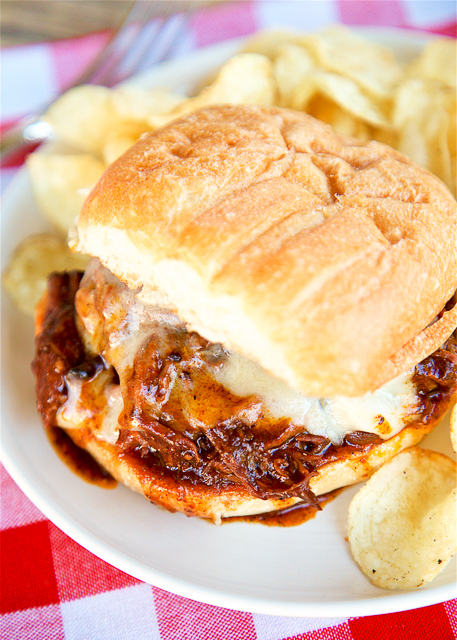 My usual BBQ is pork, but I have to say that these Slow Cooker Texas BBQ Beef Sandwiches may have me switching sides! Y'all these were SO good! Not only were these sandwiches delicious, they were stupid easy to make. Only three ingredients for the meat. Just dump everything in the slow cooker and let it works its magic! No need to heat up the house or fire up the grill. Just a magical slow cooker doing its thang. We served these Slow Cooker Texas BBQ Beef Sandwiches on some yummy french bread rolls from the grocery store. They would also be good on slider buns or even on top of nachos! I LOVE BBQ Nachos! I'm heading to Memphis this Fall, and you can bet your bottom dollar that I will be eating some BBQ Nachos at Rendezvous. This recipe makes a lot of BBQ. It is great for parties or potlucks. You can also freeze the leftovers for later. We actually have some in the freezer right now that we are going to make some nachos with this weekend. YUM! Place chuck roast in slow cooker. Sprinkle chili seasoning and pour BBQ sauce over roast. Remove roast from slow cooker and shred beef with 2 forks. Skim fat from cooking juices. Return meat to slow cooker. Using a slotted spoon, place meat on bottom of each hamburger bun and top wit cheese. Top with top bun.